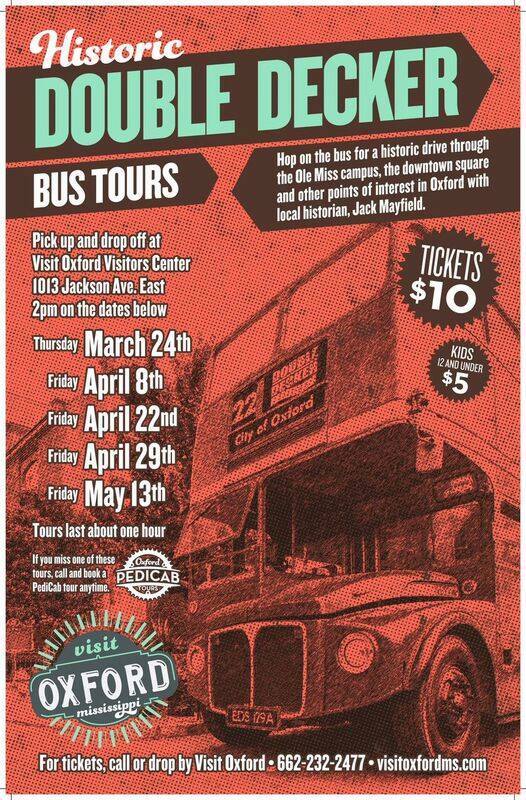 Visit Oxford’s Double Decker Spring Public Bus Tour Schedule has been set! The hour-long tour will include a ride on the popular Double Decker bus through the Ole Miss campus, the Historic Downtown Square, and other points of interest in Oxford. Historian Jack Mayfield will give tourists the history of Oxford while cruising along. All tours leave from and return to the Oxford Visitors Center located at 1013 Jackson Avenue. Please notice we have moved, and this is our new address. Please be sure to call Visit Oxford at 662-232-2477 to pay with your credit card, or come in our new office to pay cash, card, or check. THE ONLY WAY TO RESERVE YOUR SPOT AHEAD OF TIME IS TO PAY AHEAD OF TIME.